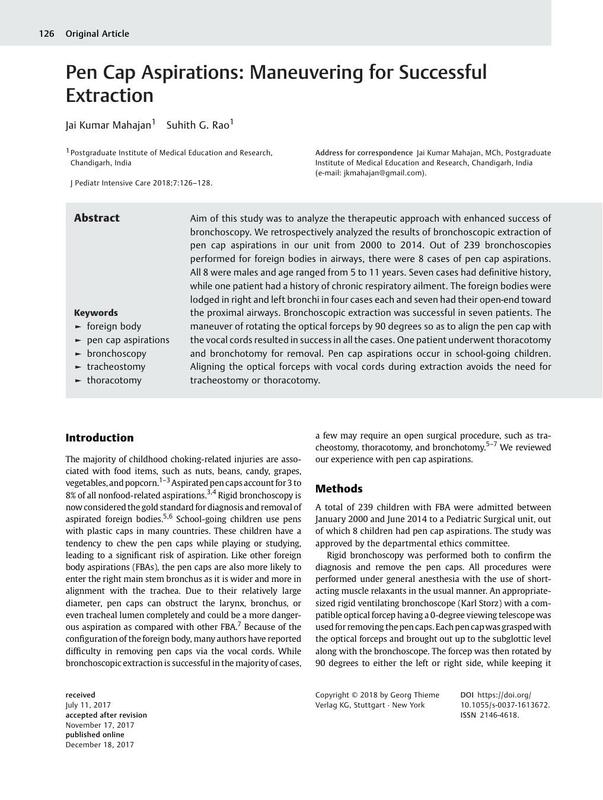 Aim of this study was to analyze the therapeutic approach with enhanced success of bronchoscopy. We retrospectively analyzed the results of bronchoscopic extraction of pen cap aspirations in our unit from 2000 to 2014. Out of 239 bronchoscopies performed for foreign bodies in airways, there were 8 cases of pen cap aspirations. All 8 were males and age ranged from 5 to 11 years. Seven cases had definitive history, while one patient had a history of chronic respiratory ailment. The foreign bodies were lodged in right and left bronchi in four cases each and seven had their open-end toward the proximal airways. Bronchoscopic extraction was successful in seven patients. The maneuver of rotating the optical forceps by 90 degrees so as to align the pen cap with the vocal cords resulted in success in all the cases. One patient underwent thoracotomy and bronchotomy for removal. Pen cap aspirations occur in school-going children. Aligning the optical forceps with vocal cords during extraction avoids the need for tracheostomy or thoracotomy.